THE NYMPHAI (Nymphs) were beautiful nature-spirits responsible for the nurture of the plants and animals of the countryside and wilds. They were worshipped by the rustic folk--shepherds and herdsmen, hunters and woodsmen, orchadists and beekeepers. The following series of tales describe encounters between nymphs and men. 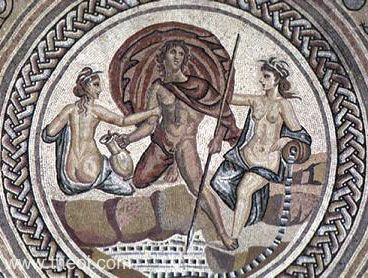 The nymph types are largely interchangeable--in the tale of Peleus a Nereid sea-nymph takes on the role of an Epimelid nymph of the flocks, while in the tale of Kerambos the nymphs are simultaneously Naiades of the river and Hamadryades of river-side poplars. "Dryope herded the flocks of her father. Now, the Nymphai Hamadryades (Hamadryad Nymphs) were very much attached to her and made her their companion, teaching her to sing to the gods and to dance. Apollon, seeing her dancing, felt an urge to couple with her. He first changed himself into a tortoise. Dryope, with the other Nymphai, was amused by it and they made a toy of the tortoise. She placed it in her bosom. He changed from a tortoise to a serpent. The frightened Nymphai abandoned Dryope. Apollon coupled with her and . . . she gave birth to Amphissos (Amphissus), the son of Apollon . . . In Dryopis he established a sanctuary of Apollon. One day, as Dryope was approaching the temple, the Nymphai Hamadryades gathered her up affectionately and hid her in the woods. In her place they caused a poplar to appear out of the ground. Beside it they made a spring to gush forth. Dryope was changed from mortal to Nymphe. Amphissos, in honour of the favour shown to his mother, set up a shrine to the Nymphai and was the first to inaugurate a foot-race there. To this day local people maintain this race. It is not holy for women to be present there because wo maidens told local people that Dryope had been snatched away by Nymphai. The Nymphai were angry at this and turned the maidens into pines." "The loveliest girl of all Oechalis, dear Dryope, her mother's only child . . . There is a lake whose shelving sides had shaped a sloping shore, and myrtles crowned the ridge. There Dryope had come, not dreaming of fate's design, and, what must make you more indignant, bringing garlands for the Nymphae (Nymphs) . . . Near the lakeside was a water-lotus flowered, its crimson blooms like Tyrian dye, fair hope of fruit to come. Dryope picked a posy of these flowers to please her boy. I [her companion Iole] meant to do the same (for I was there), when I saw drops of blood drip from the blossoms of the boughs shiver in horror. For this shrub, you see (too late the peasants told us), was the Nymphe Lotis who fled Priapus's lechery and found changed features there but kept her name. Nothing of this my sister knew. She'd said prayers to the Nymphae and now in terror tried to turn away and leave, but found her feet rooted [and she was transformed into a lotus-tree]." "Miletos (Miletus) built the city of Miletos and . . . [had] twins, Kaunos (Caunus) and Byblis . . . Byblis attracted many local suitors . . . She did not pay them much attention since an unspeakable desire for Kaunos was driving her mad. Because she did all she could to hide this passion, she kept it from her parents. But daily she was being gripped by an even more unmanageable Daimon and one night she decided to throw herself from a rock. She went to a nearby mountain and set about throwing herself off. But Nymphai (Nymphs), pitying her, held her back. Casting her into a deep sleep they changed her from a mortal to a deity, into a Nymphe called a Hamadryas (Hamadryad) named Byblis. They made her their companion and sharer of their way of life. The stream which flows from that rock is called to this day by local people the Tears of Byblis." "[Miletus had children] Byblis and Caunus, twins, a tragic pair. The tale of Byblis shows that girls should love as law allows, Byblis who lost her heart to great Apollineus [Caunus], her twin brother. Hers was no sister's love; her love was wrong . . . Poor girl, she passed all bounds, kept offering herself to his rebuffs, and soon, no end in sight, her brother fled, fled from his country and the scene of shame to found a city in a foreign land. Then Byblis was beside herself with grief. She beat herself in frenzy . . . [and] ran howling through the countryside, watched by the wives of Bubasis, then on through Caria and Lycia she roamed, among the warrior Leleges, and now Cragus was far behind her and the streams of Limyre and Canthos . . . The forest failed; on the hard ground she fell, exhausted by her quest, and lay face down, with tumbled hair, among the fallen leaves. Often the Nymphae Lelegeides (Lelegian Nymphs) tried to cradle her in their soft arms and often sought to salve the fever of her love, and comforted with soothing words her heart that heard no more. She lay in silence, clutching the small sedge, and watering the greensward with her tears. And these, men say, the Naides (Naiads) made a rill, for ever flowing--what could they give more? At once, as resin drips from damaged bark, or asphalt oozes from the earth's dark womb, or, when the west wind breathes its balm, the sun unlocks the water that the frost has bound, so, wasting by her weeping all away, Byblis became a spring. Still in that dale it keeps its mistress' name, still mournfully trickles below the tall dark ilex tree." "Kerambos (Cerambus), son of Eusiros (Eusirus), who was the son of Poseidon and of Eidothea the Nymphe of Othreis, lived in the land of the Melians on the spurs of Mount Othrys. He had numerous flocks and herded them himself. Nymphai (Nymphs) would help him since he delighted them as he sang among the mountains. He is said to have been the best singer of those days and was famous for his rural songs. In those hills he devised the shepherd's pipes and was the first to teach mankind to play the lyre, composing many beautiful songs. It is said that because of this the Nymphai one day became visible to Kerambos as they danced to the strumming of his lyre. Pan, in good will, gave him this advice : to leave Othrys and pasture his flocks on the plain, for the coming winter was going to be exceptionally and unbelievably severe. Kerambos, with the arrogance of youth, decided--as though smitten by some god--not to drive his beasts from Othrys to the plain. He also uttered graceless and mindless things to the Nymphai, saying they were not descended from Zeus, but that Deino had given birth to them, with the River Sperkheios (Spercheus) was the father. He also said that Poseidon, for lust of one of them, Diopatre (Diopatra), had made her sisters put down roots and turned them into poplars until, satiated with his desires, he had returned them to their original shapes. Thus did Kerambos taunt the Nymphai. After a short while there came a sudden frost and the streams froze. Much snow fell on the flocks of Kerambos and they were lost to sight as well as were the trees and paths. The Nymphai, in anger against Kerambos because of his slanders, changed him into a wood-gnawing Kerambyx beetle. He can be seen on trunks and has hook-teeth, ever moving his jaws together. He is black, long and has hard wings like a great dung beetle. He is called the ox that eats wood and, among the Thessalians, Kerambyx (Cerambyx). Boys use him as a toy, cutting off his head, to wear as a pendant. The head looks like the horns of a lyre made from a tortoiseshell." "The Megarians say that the Nymphai Sithnides (Sithnian Nymphs) are native, and that one of them mated with Zeus; that Megaros (Megarus), a son of Zeus and of this Nymphe, escaped the flood in the time of Deukalion (Deucalion), and made his escape to the heights of Gerania. The mountain had not yet received this name, but was then named Gerania (Crane Hill ) because cranes were flying and Megaros swam towards the cry of the birds." "Aristaeus the shepherd, quitting Tempe by the Peneus, when--so runs the tale--his bees were lost through sickness and hunger . . .
Tarrying not, he straightway does his mother's bidding. He comes to the shrine, raises the altars appointed, and leads there four choice bulls, of surpassing form, and as many heifers of unyoked neck. Later, when the ninth Dawn had ushered in her rising beams, he offers to Orpheus the funeral dues, and revisits the grove. But here they espy a portent, sudden and wondrous to tell--throughout the paunch, amid the molten flesh of the oxen, bees buzzing and swarming forth from the ruptured sides, then trailing in vast clouds, till at last on a treetop they stream together, and hang in clusters from the bending boughs." "The lord [Peleus] of the Wolf [sent by Psamathe] that devoured the atonement [a herd of cattle] and was turned to stone [by Thetis]." "Aiakos (Aeacus) . . . has as sons Telamon and Peleus and a third, Phokos (Phocus), born of Psamathe, daughter of Nereus. Aiakos was very fond of this third son because he was handsome as he was god. Peleus and Telemon envied him and killed him in secret. For this Aiakos drove them away and they left the isle of Aigina (Aegina) . . . Peleus brought together many sheep and cattle [while in exile] . . . A wolf, coming upon the animals unattended by herdsmen, ate them all. By divine will this wolf was changed into a rock which stood for a long time between Lokris (Locris) and the land of the Phokians (Phocians)." There was a tower, a beacon high atop the citadel, a landmark to rejoice a weary ship. They climbed here and beheld with groans, the cattle strewn along the shore, and the destroyer, wild and bloody-jawed, his shaggy coat all red and caked with gore. Stretching his hands toward the open sea, Peleus addressed his prayers to Psamathe, the wave-blue Nympha, that she would end her wrath and bring her succour. Her no prayer of his could turn, but Thetis for her husband's sake pleaded and won her pardon. But the wolf though called from his fierce slaughter, still kept on, wild with the nectar-taste of blood, until as he tore a heifer's neck and held it fast, she changed him into marble. Everything save colour was preserved; the marble's hue proclaimed him wolf no longer and no more a terror to be dreaded as before. Yet in that country, even so, fate would not let banished Peleus find a home. He roamed in exile to Magesia, and there Acastus Haemonius [of Thessaly] gave absolution for his guilt of blood." "In holy Dotion dwelt the Pelasgians and unto thyself they made a fair grove abounding in trees; hardly would an arrow have passed through them. Therein was pine, and therein were mighty elms, and therein were pear-trees, and therein were fair sweet-apples; and from the ditches gushes up water as it were of amber. And the goddess [Demeter] loved the place to madness . . . Then the worse counsel took hold of Erysikhthon (Erysichthon). He hastened with twenty attendants, all in their prime, all men-giants able to lift a whole city, arming them both with double axes and with hatchets, and they rushed shameless into the grove of Demeter. Now there was a poplar, a great tree reaching to the sky, and thereby the Nymphai (Nymphs) were wont to sport. This poplar was smitten first and cried a woeful cry to the others. Demeter marked that her holy tree was in pain, and she was angered . . . beyond telling . . . [and] sent on him a cruel and evil hunger--a burning hunger and a strong--and he was tormented by a grievous disease. Wretched man, as much as he ate, so much did he desire again." "[Erysikhthon (Erysichthon)] was a man who spurned the gods and never censed their shrines. His axe once violated Ceres' [Demeter's] grove, his blade profaned her ancient holy trees. Among them stood a giant oak, matured in centuries of growing strength, itself a grove; around it wreaths and garlands hung and votive tablets, proofs of prayers fulfilled. Often beneath its shade Dryades (Dryads) danced in festival and often hand in hand their line circled its trunk, full fifty feet of giant girth; it towered high above the woodland trees as they above the grass. Yet even so that wicked man refused to spare his blade, and bade his woodsmen fell that sacred oak, and when he saw them slow to obey he seized the axe himself, and cried ‘Be this the tree the goddess loves, be this the goddess' very self, its leafy crown shall touch the ground today', and poised his axe to strike a slanting cut. The holy tree shuddered and groaned, and every leaf and acorn grew pale and pallor spread on each long branch. And when his impious stroke wounded the trunk, blood issued, flowing from the severed bark, as when a mighty bull is sacrificed before the altar and from his riven neck the lifeblood pours. All stood aghast, but one was bold to thwart the crime, to stay the steel. Then Erysichthon glared at him : ‘Take this for pious thoughts’ he cried and turned the axe against the man and struck the man's head off, and blow on blow, attacked the oak again. Then deep from the tree's heart there came a voice : ‘I, Ceres' [Demeter's] Nymphe, Ceres' most favourite Nymphe, dwell in this oak, and, dying, prophesy that punishment is night for what you do, to comfort me in death.’ But he pursued his crime, till weakened by so many blows, hauled down by ropes, at last the giant oak crashed and its weight laid low the trees around. Heartbroken by their loss--the grove's loss too--her sister Dryades, clad in mourning black, going to Ceres, prayed for punishment on Erysichthon. That most lovely goddess assented and the teeming countryside, laden with harvest, trembled at her nod. A punishment she planned most piteous, were pity not made forfeit by his deed--hunger to rack and rend him; and because Ceres [Demeter] and Hunger [Limos] may never meet, she charged a mountain sprite, a rustic Oread, to take her message . . . She gave the chariot; riding through the air the Oread reached Scythia; on a peak of granite men call Caucasus she unyoked the dragons and set out in search of Hunger, and found her in a stubborn stony field . . . Eyeing her from a distance, fearing to go closer, the Nymphe gave her the goddess' orders and hardly waiting, though some way away, though just arrived, she felt, or seemed to feel, hunger and seized the reins and soaring high she drove the dragons back to Thessaly." "There was a time in that man's [Paraibios' (Paraebius')] life when the more he toiled the harder he found it to keep body and soul together. He sank lower day by day, and there was no respite from his labours. He was paying in misery for a sin committed by his father, who had refused to listen to a Hamadryas' (Hamadryad's) prayers when he was felling trees one day, alone in the mountains. She wished him to spare the stump of an oak which was as old as she and had been her only home for many a long year. She wept and pleaded with him piteously. But in the headstrong arrogance of youth he cut it down; and in revenge the Nymphe laid a curse on him and his children. When Paraibios consulted me, I realized the nature of the sin and told him to an altar to build an altar to the Thynian Nymphe and there make an offering in atonement, with prayers for release from his father's doom. Thus he escaped the wrath of Heaven." "Hylas whom Herakles (Heracles) loved, while off on a mission to fetch water, was kidnapped by Nymphai (Nymphs) because of his beauty." "Hylas had bone off by himself with a bronze ewer in search of some hallowed spring where he could draw some water for the evening meal . . . Hylas soon found a spring, which the people of the neighbourhood call Pegai (Pegae, the Springs). He reached it when the Nymphai (Nymphs) were about to hold their dances--it was the custom of all those who haunt the beautiful headland to sing the praise of Artemis by night. The Nymphai of the mountain peaks and caverns were all posted some way off to patrol the woods; but one, the Naias of the spring, was just emerging from the limpid water as Hylas drew near. And there, with the full moon shining from a clear sky, she saw him in all his radiant beauty and alluring grace. Her heart was flooded by desire; she had a struggle to regain her scattered wits. But Hylas now leant over to one side to dip his ewer in: and as soon as the water was gurgling loudly round the ringing bronze she threw her left arm round his neck in her eagerness to kiss his gentle lips. Then with her right hand she drew his elbow down and plunged him in midstream . . .
[The sea-god Glaukos (Glaucus) later reports his abduction to the Argonauts :] ‘As for Hylas, who caused these two to go astray and so be left behind, a Nymphe has lost her heart to him and made him her husband.’"
"The boy Hylas went carrying a pail to the River Askanios (Ascanius) to fetch water for the leaders [Argonauts]. And when the Nymphai (Nymphs), who were the daughters of this River, saw and fell in love with him, they pulled him in, dragging him down into the spring. After Hylas had disappeared, Herakles saw that he was not coming back to him and deserted the heroes, searching everywhere in the thickets, calling ‘Hylas’ again and again. The Nymphai, fearing that Herakles might discover that they had hidden the lad among them, changed him into a n echo which again and again echoed back the cries of Herakles . . . To this day local people make sacrifices to Hylas by the spring. The priest calls him by his name three times and an echo replies three times." "Here [Kios (Cius) in Bithynia] is the scene of the myth of Hylas, one of the companions of Herakles who sailed with him on the Argo, and who, when he was going out to get water, was carried off by the Nymphai (Nymphs)." "The squire [Hylas] of the invincible prince [Heracles] ranged farther afield to seek the choice water of a sequestering spring . . . Hylas went on, alas, went on to the Hamadryades (Hamadryads). Here beneath the crest of Arganthus' mount lay the well of Pege, a watery haunt dear the Nymphae Thyniae (Thynian Nymphs); overheard from deserted trees hung dewy apples, owing naught to the hand of man, and round about in the water-meadow grew white lilies mingled with crimson poppies. Now in boyish delight plucking these with delicate nail, putting flowers before his appointed task, and now unwarily bending over the beauteous pool, he prolongs his truancy because of its charming reflections. At length, with lowered hands he prepares to cup the water, leaning on his right shoulder to draw a full measure. When the Dryades (Dryads), fired by his beauty, abandoned in wonder their accustomed dance and on his slipping pulled him nimbly through the yielding water, then by the snatching of his body did Hylas cause a loud sound. In answer Hercules from afar thrice called out ‘Hylas!’, but to him from distant hills the breeze echoes naught save the name." "She [the Naiad Dryope] puts up a swift hart through the trackless brushwood [luring Hylas away from Heracles in pursuit of the animal] . . . The stag leads him far onward to where a bright fountain gushes forth, and with light bound [the stag] springs clear over the pool. Thus is the lad's hope baffled nor is he fain to struggle farther; and since sweat had bathed his limbs and labouring breast, he greedily sinks beside the pleasant stream. Even as the light that shifts and plays upon a lake . . . so doth he shed a gleam upon the waters; he heeds not the shadow of the Nympha or her hair or the sound of her as she rises to embrace him. Greedily casting her arms about him, as he calls, alack! Too late for help and utters the name of his mighty friend [Heracles], she draws him down; for her strength is aided by his falling weight." "Lo! In a vision [to Heracles] the boy [Hylas] rises from the water's level, clad in saffron weeds, the gift of the unkind Nympha, and standing by his dear head utters such words as these: ‘Why, father, dost thou waste time in vain lament? Mine now by fate's appointing is this glade, this home, wither at cruel Juno's [Hera's] behest the wanton Nympha has stolen me; now doth she win me power to consort with the streams of Jove [Zeus] and the heavenly deities, and shares with me her love and the honours of the fountain.'" "[Naiad] ravisher of Hercules young ward [Hylas]." "The Nais (Naiad) of the dark-blue water would have preferred thee [to Hylas], and grasped thy urn and drawn thee down more boldly." "The Nymphai (Nymphs) had hidden dainty Hylas in their envious water, a bridegroom kept safely for the greedy watersprite." "In Sikelia (Sicily) was born Daphnis the son of Hermes, who was skilled in playing on the pipes and also exceedingly beautiful. He would never frequent the places where men come together, but spent his life in the open, both winter and summer, keeping his herds on the slopes of Aitna (Etna). The nymphe Ekhenais (Echenais), so the story runs, fell in love with him, and bade him never have to do with mortal woman; if he disobeyed, his fate would be to lose his eyes. For some considerable time he stood out strongly against all temptation, although not a few women were madly in love with him; but at last one of the Sicilian princesses worked his ruin by plying him with much wine, and so brought him to the desire to consort with her. Thus he, too, like Thamyras the Thracian, was thenceforward blind through his own folly." "There are in Sikelia (Sicily), namely, the Heraion (Heraean) Mountains, which, men say, are naturally well suited, by reason of the beauty and nature and special character of the region round about, to relaxation and enjoyment in the summer season. For they possess many springs of exceptionally sweet water and are full of trees of every description. On them also is a multitude of great oak-trees which bear fruit of extraordinary size, since it is twice as large as any that grows in other lands . . . It was in this region, where there were glens filled with trees and meet for a god and a grove consecrated to the Nymphai (Nymphs), that, as the myths relate, he who was known as Daphnis was born, a son of Hermes and a Nymphe, and he, because of the sweet bay (daphnê) which grew there in such profusion and so thick, was given the name Daphnis. He was reared by Nymphai, and since he possessed very many herds of cattle and gave great attention to their care, he was for this reason called by the name Boukolos (Bucolus) or ‘Neatherd.’ And being endowed with an unusual gift of song, he invented the bucolic or pastoral poem and the bucolic song which continues to be so popular throughout Sikelia (SIcily) to the present day. The myths add that Daphnis accompanied Artemis in her hunting, serving the goddess in an acceptable manner, and that with his shepherd's pipe and singing of pastoral songs he pleased her exceedingly. The story is also told that one of the Nymphai became enamoured of him and prophesied to him that if he lay with any other woman he would be deprived of his sight; and indeed, when once he had been made drunken by a daughter of a king and had lain with her, he was deprived of his sight in accordance with the prophecy delivered by the Nymphe. As for Daphnis, then, let what we have said suffice." "Tellers of stories say that in the land of the Messapians [in Italy] near the so-called Sacred Rocks there appeared the choral troupe of the Nymphai Epimelides (Epimelid Nymphs, Protectors of Sheep). Young Messapians left their flocks to view them. They declared they themselves could dance better. What they said irritated the Nymphai and rivalry arose increasingly over their dancing. Because the youths did not know that they were competing with deities, they danced as they would in a contest with mortals of their own age. Their manner of dancing, being that of shepherds, was without art, while that of the Nymphai was entirely dedicated to beauty. In their dancing they surpassed the youths and they said to them : ‘Young men, did you want to compete against the Nymphai Epimelides? So, you foolish fellows, now that you have been beaten, you will be punished.’ The youths, as they stood by the sanctuary of the Nymphai, were changed into trees. Even today one hears at night the sound of groans coming from the trunks. The place is called that of the Nymphai and the Youths." "The bays and pastures of Apulia [in Italy], there he had seen a grotto deep in shade, of forest trees, hidden by slender reeds, the home of half-goat Pan, though once the Nymphae (Nymphs) lived there. A local shepherd frightened them; they fled away at first in sudden fear, but soon recovering, disdained the lout who had pursued them and began again the nimble measure of their country dance. The shepherd mocked them, mimicking the dance with loutish leaps and shouts of coarse abuse and rustic insults. Nothing silenced him till wood enswathed his throat. For he's a tree, and from its juice you judge its character. The oleaster's bitter berries bear the taint of that tart tongue; they keep today the sourness of the things he used to say."